Now adays, more and more music artists and bands publish so called Audio-DVD's. Usually this is a compilation of music, videoclips, interviews etc. The audio track is commonly of a high quality. So how to I rip the audio from these Audio-DVD's to later compile a regular Audio-CD or a CD with MP3's? Or; how to convert this DVD to MP3's or WAVs? A company called ImToo created a tool specific for this purpose, called "DVD Audio Ripper". It's a small tool but very effective. You can download a trial version at their website or from the WeetHet downloads page. The tool sets you back app. $35 if you decide to buy it. Note: Read the disclaimer as in some countries ripping an Audio-DVD, even for your own use, can be illegal! First of all a Audio-DVD. For demonstration purposes I used the U2 Audio-DVD "Rattle and Hum". Second of all, a PC with a DVD-Rom drive and finally the tool "DVD Audio Ripper". The tool can be downloaded at the ImToo website, or from the WeetHet downloads page (this is a trial version). Now insert your DVD in the DVD-Rom player of your PC. Wait a few seconds for your PC to recognize the DVD, then click the blue DVD button or open the "File" menu and choose the option "Open DVD". 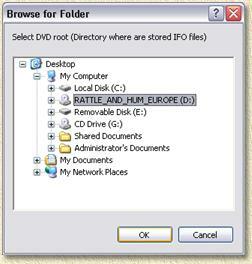 A dialog will appear asking you to select your DVD drive. Select the drive and click "OK". Note: some DVD's might be protected from copying. If DVD Audio Ripper doesn't recognize your DVD or produces errors (haven't seen any yet) then please consider ripping the DVD to your harddrive using SmartRipper. 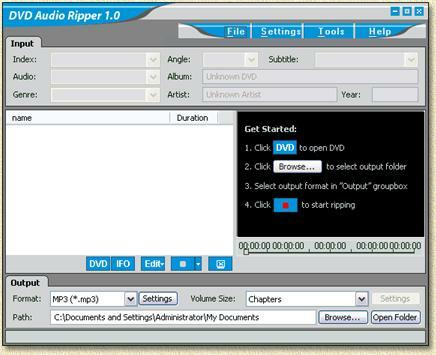 If you have used this approach, then use the dialog to browse to the folder holding the ripped copy of your DVD. Note: Here you see that "Title 1" is being selected. This should not be the case as it will otherwise rip the entire "movie" as a single audio file. So ONLY select the "chapters". In this list of tracks, you can use the F2 button to rename the tracks (used for filenames!). Select the track you wish to rename and press F2. Before we continue with the actual ripping, first enter some data in the "Input" section. Here you can enter artist, year, etc. 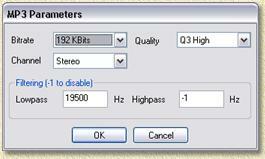 This information is used to enter the MP3-tags of the MP3 files. Next step will be to set which format files we want. We have 2 options: MP3 or WAV. To save space while trying this, we will continue using MP3, but feel free to use WAV if you want to. You can make your choice in the "Output" section. It will take a while (on my Pentium M 1,6 Ghz it took about 30 minutes for this particular Audi-DVD). That's all folks ... enjoy!